Should you buy the Helios 300? 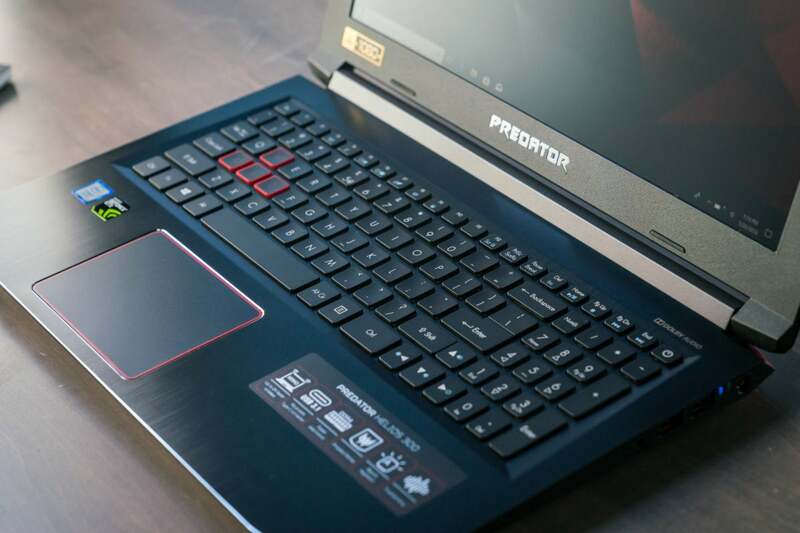 With the monstrous Predator 21 X and sleek Predator Triton 700, Acer staked a compelling claim on the high-end market, loading its notebooks with extravagant features and the most powerful portable gaming hardware available. The Acer Predator Helios 300 doesn’t concern itself with fanciful bells and whistles. It’s a straightforward, no-nonsense gaming laptop that delivers a refreshing amount of bang for your buck, starting at $1,100 on Amazon with a Core i7-7700HQ processor and a GeForce GTX 1060 graphics card. The Acer Predator Helios 300 isn’t quite perfect. The display runs dimmer than its rivals, and the storage is cramped. But beyond those minor grumbles, this machine checks all the boxes you could ask for in an affordable gaming laptop. It’s even easy to repair! Around this price range, you’ll normally find gaming laptops equipped with a lesser-powered GeForce GTX 1050 or GTX 1050 Ti graphics card, or a middling Core i5 CPU. 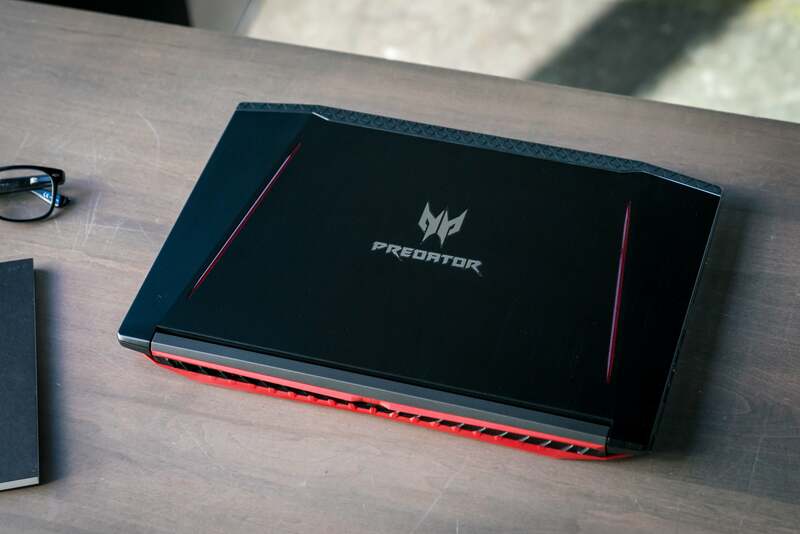 Not here: The Predator packs the same quad-core Core i7-7700HQ processor found in laptops that cost two or three times more, along with a full-fat 6GB GeForce GTX 1060—no dialed-back Max-Q version here. Despite the affordable price, Acer didn’t skimp on the memory, stocking the Helios 300 with 16GB of DDR4 RAM. The only ho-hum hardware? Storage. This entry-level configuration includes an SSD with a scant 256GB capacity that’ll fill up fast in this era of plus-sized games. It’s nice and fast in practice, though. Acer offers another configuration that supplements the SSD with a 1TB mechanical hard drive, but at a steep $300 premium. Given how easy it is to crack open the Predator Helios 300—the empty hard drive bay is secured shut by a single Phillips screw—I’d recommend going the DIY route to add more storage to the laptop. The laptop chassis includes plenty of plastic, as you’d expect in a gaming notebook in this price range, but Acer augments it with a sleek, brushed-metal lid and keyboard deck. Two angled red stripes flank the Predator logo on the lid, ensuring everyone in the coffee shop knows you’re using an Acer. It’s a fingerprint magnet, though. With 5 pounds, 7.9 ounces of heft and a 1.1-inch thickness, the Helios 300 is fairly compact for a gaming rig. You’ll feel it in your backpack but won’t break your spine lugging it around. The inputs feel comfortable and responsive, too. The chiclet-style keys have plenty of travel and aren’t overly loud in use. Fetching red backlights augment the keyboard and look nice against the black keys. They can be turned on or off manually, but not dimmed or customized on a per-key basis. The clickpad-style touchpad handles very smoothly and accurately. I’d have preferred dedicated left- and right-click buttons, but hey, I’m a purist. The Helios 300’s keyboard and touchpad excel overall. I wish I could say the same for the 1920x1080 IPS display. It’s nice and sharp with wide viewing angles, but far too dim. In fact, at 230 nits maximum, it doesn’t even hit the minimum brightness level we use for our battery run-down tests, which run at a standardized 250 to 260 nits to simulate comfortable indoor viewing. Some colors lack pop and feel washed-out as a result, especially vibrant hues. Don’t get me wrong: The Predator Helios 300’s display is serviceable overall. It’s just lackluster compared to rival screens. Here's a look at the laptop's port selection. The USB 3.1 Type-C port is a nice touch that you normally don't see in this price bracket. The Acer Predator Helios 300 packs an awful lot of punch for its price. 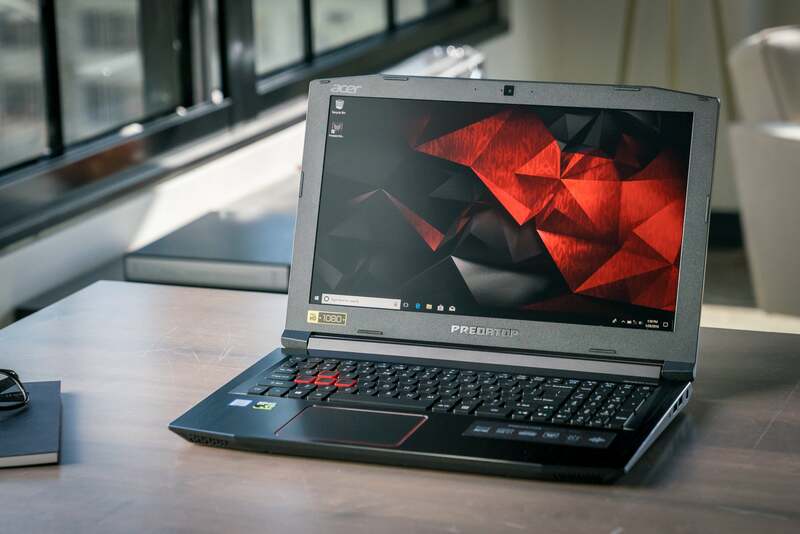 We’ll be comparing it against several similar systems in our tests, including the $950, GTX 1060 Max-Q-equipped Dell Inspiron 15 7000 Gaming, the thin-and-light, $2,200 Gigabyte Aero 15X with a GTX 1070 Max-Q, and the $1,250 Microcenter PowerSpec 1510 with a full-fat GTX 1070. Maxon’s Cinebench R15 measures raw CPU performance, and will happily use as many threads as you can throw at it. All of the gaming laptops being compared today use the quad-core Intel Core i7-7700HQ except the Dell Inspiron, which uses a Core i5 chip instead. 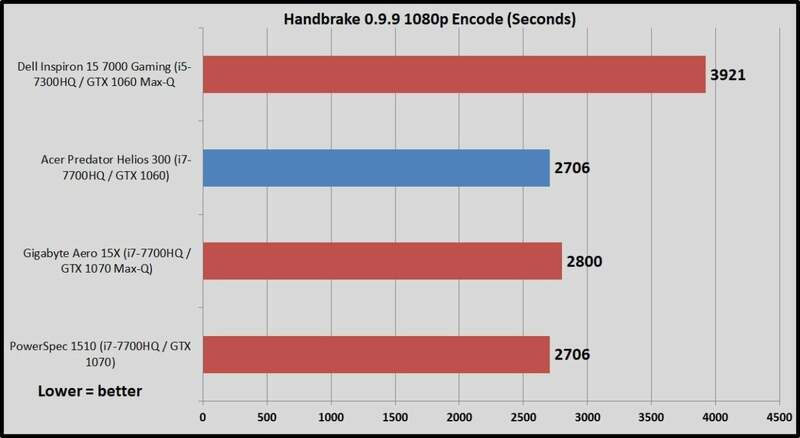 Because the chip lacks hyper-threading support, Dell’s laptop brings up the rear in Cinebench’s multi-threaded benchmark by a large margin. The others deliver virtually identical performance results. 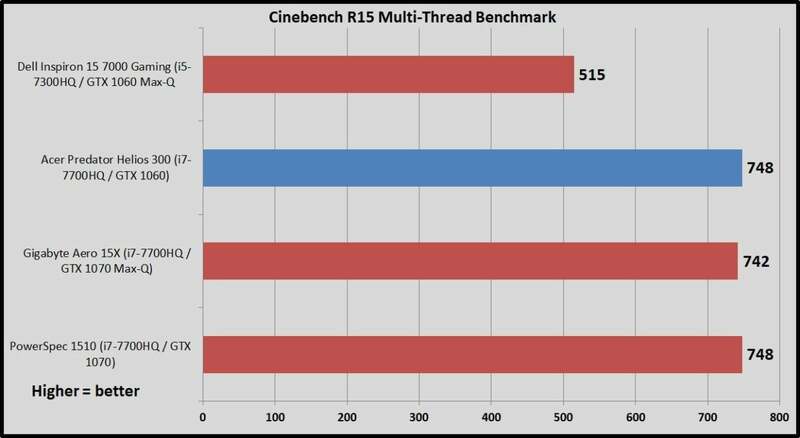 But Cinebench’s benchmark runs in a short duration. The file we encode in our CPU-intensive HandBrake test (which uses an older version of the software) takes around 45 minutes on a quad-core processor. The extended duration reveals how a laptop’s temperature throttling affects performance over time. Once again, the Core i7-7700HQ laptops turn in similar results, with the Core i5-equipped Dell Inspiron lagging far behind. 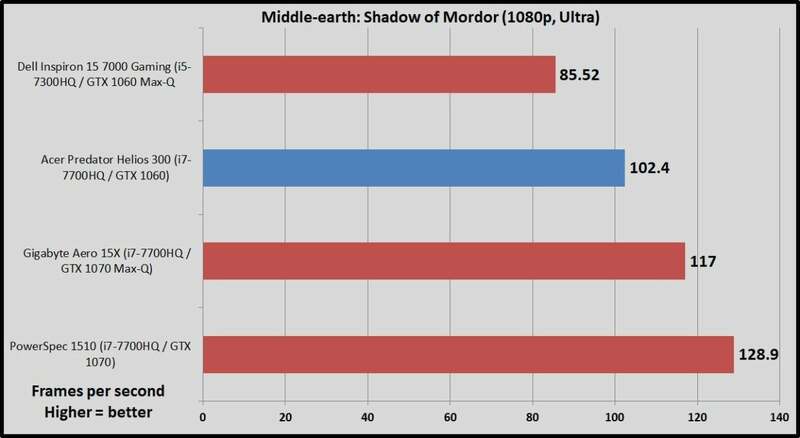 Gaming laptops need strong graphics capabilities, of course. 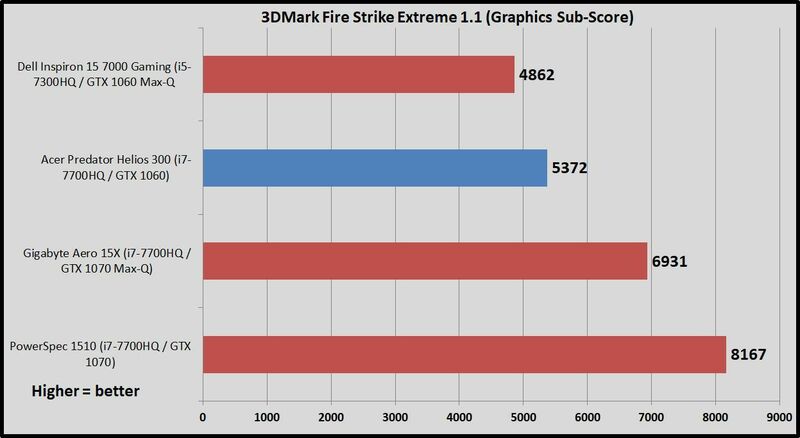 We test their visual chops using the Graphics sub-score in 3DMark’s Fire Strike Extreme benchmark, a synthetic benchmark that focuses on pure GPU performance. This test illustrates how Nvidia’s efficient Max-Q GPUs achieve their energy savings in part by dialing back performance. 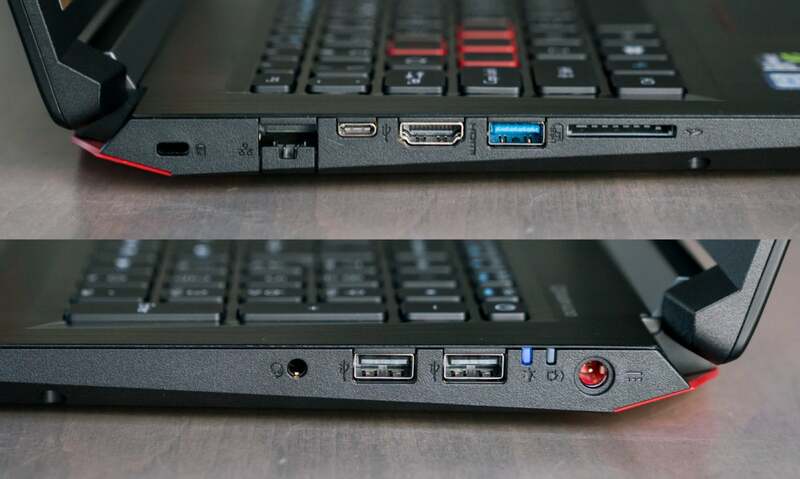 Again: The Inspiron has a GTX 1060 Max-Q, the Predator Helios 300 being reviewed packs a full GTX 1060, the Gigabyte Aero 15X holds a GTX 1070 Max-Q, and the chunky PowerSpec laptop keeps the pedal to the medal with a full-fat GTX 1070. But enough synthetic benchmarks. Let’s get to the games! We compare laptop gaming performance at 1080p resolution to standardize results across the board, using the in-game benchmarks included with each title. The GTX 1060 inside the Predator Helios 300 excels at this resolution, with frame rates surpassing display’s 60Hz speed across the board. 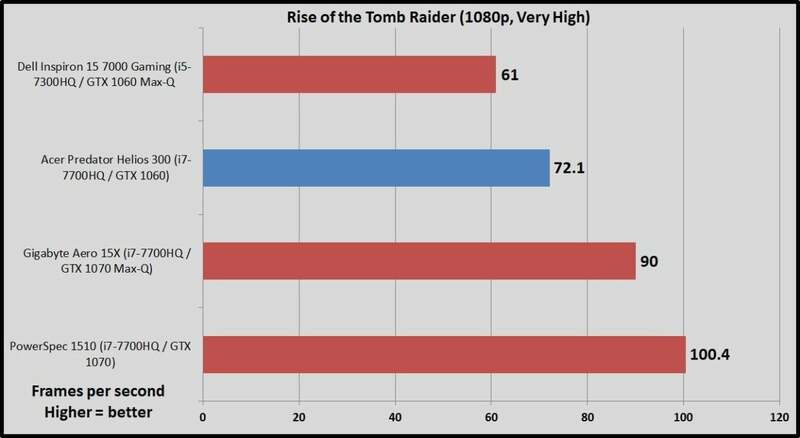 These gaming results once again show the difference with Max-Q versions of Nvidia’s GPUs. The full-blown GTX 1060 is solidly ahead of the Max-Q variant in the Dell Inspiron. Moving up to a GTX 1070 provides a big jump in performance as you’d expect, with the GTX 1070 Max-Q splitting the difference. 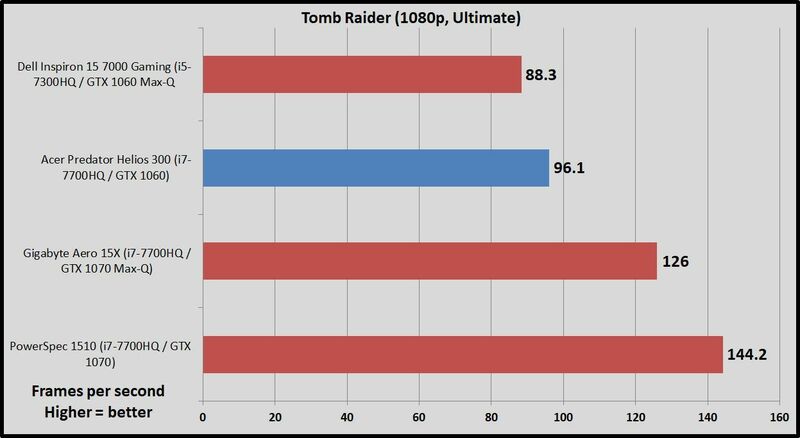 We also ran the Rise of the Tomb Raider benchmark continuously for an hour, and the only performance drop-off observed fell within the margin of error—around a frame per second. The Acer Predator Helios 300’s cooling does its job, and it does so without being overly loud. This is a gaming laptop, though. Expect to still hear the fans when you fire up games or otherwise put the Predator under load. Acer’s notebook offers strong endurance for a gaming laptop, clocking in at nearly 7 hours in PCWorld’s battery run-down test, which consists of looping a 4K video in the Windows 10 Movies and TV player with audio at 50 percent until the machine gives up the ghost. 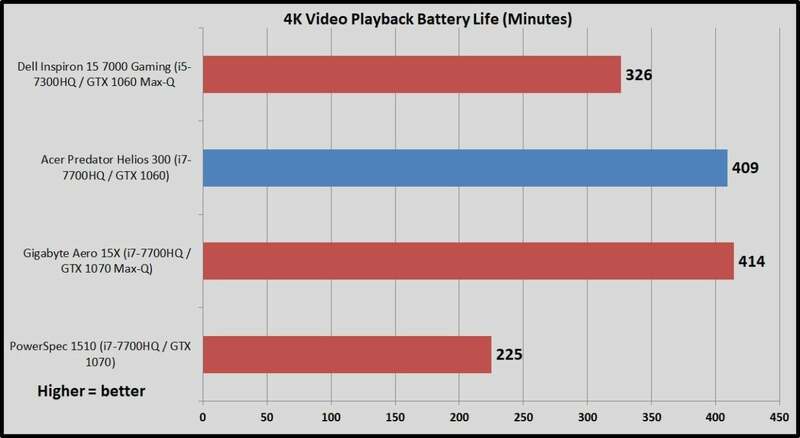 That’s comparable with the Gigabyte Aero 15X, a laptop we praised for its battery life. Two factors play strongly into the result. First, the Helios 300 does not include a G-Sync display, so it’s able to switch to the integrated graphics in the Intel CPU to save energy when you’re not gaming. The screen’s dim compared to its rivals, too. We standardize our battery life results by setting laptop brightness to 250 nits, a comfortable level for indoor viewing. Acer’s laptop maxes out at 230 nits. That skews the results in this benchmark—though it also means that the Predator genuinely lasts longer out in the real world. The screen isn’t dark enough to dissuade, though, and it’s the only semi-issue of note in the Acer Predator Helios 300. This is a great notebook. You don’t see gaming laptops this well-rounded going at such a competitive price very often. Acer loaded the Helios 300 with more potent hardware than usual for this cost tier, paired it with a comfortable keyboard and touchpad combo, then pulled it all together into a fairly portable package that won’t break your back. As far as alternatives go, the PowerSpec 15 moves up to a full-fat GTX 1070, a G-Sync display, and a supplementary 1TB hard drive for only $200 more. That’s a hell of a deal too, but it makes some compromises to hit that price. It’s a big, heavy, ugly laptop that’s only available in-store at Micro Center, plus you need to jump through arcane hoops to activate G-Sync (which nukes the laptop’s battery life). The $900 Dell Inspiron 15 7000 is another option, but it uses a lesser-powered CPU and GPU to hit its sub-$1,000 price point. The GTX 1050 Ti inside will run most games at 1080p, but not at maxed-out graphics options, and it's not very future-proof.